Elote is the Mexican name for grilled corn on the cob smothered with crumbly cheese, lime juice and a bit of cayenne pepper. It is a specialty in the Yucatan peninsula and lucky for me available in various restaurants and flea markets around Brooklyn, if you know where to look. However, if you haven't had one of these, please stop reading and go find one. It truly is one of the best street foods I can think of. 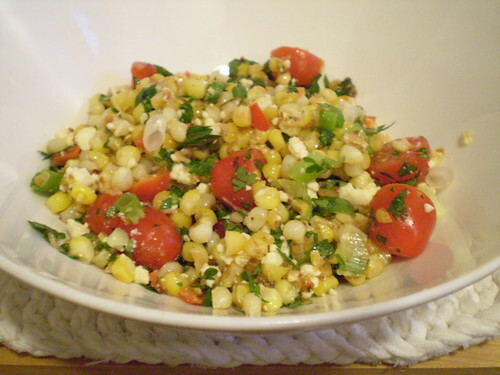 It transforms a cob of corn into an explosion of flavor. I would make this treat for myself on a regular basis if I had access to a grill, but since I don't (sob, sob) I used to just wait until I went out for Mexican food to have it. That all changed last night. On the issue of eating locally, I have been thinking a lot about how cooking different cuisines can work with a sustainable cooking philosophy. There are always going to be certain essential ingredients that are not going to be available locally if you're preparing dishes from regions and countries with a different climate. In summer I tend to cook a lot of Mexican or Mediterranean dishes, and things like citrus, or olives, or certain cheeses aren't locally sourced in the Northeast where I'm located (as far as I know). It's in these situations I think there is room for flexibility. The goal is to support sustainable food and food purveyors by voting with your fork, but it is not to suffer in the process. I think eating local is the right thing to do, and if everyone did it there would be a change in our broken food system. But, I also think allowing yourself to purchase things that are unavailable in your region is alright too. Phew. Glad I got that off my chest. Back to the dish. I got the idea for this salad after reading Mark Bittman's article last week in the NY Times Dining section. It was another one of his mega-lists of quick and genius flavor combinations. If you missed it, go and read it here. I know I'm going to use this list again and again when I'm having a cooking block. It's no coincidence that I picked his idea for deconstructing elote for a corn salad as my first dish. It is perfect for a picnic, or when you don't have access to a grill. Or for someone who just wants to eat with a fork. 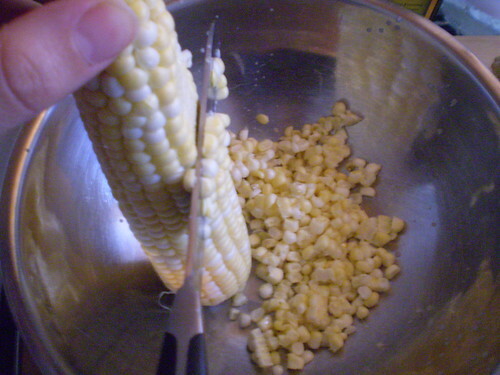 Basically, you take the corn off the cob and quick roast it until it gets a bit brown in a skillet. 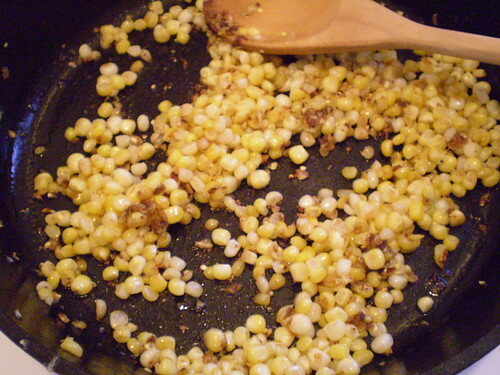 This will cause a wonderful toasted corn smell to infuse your kitchen. 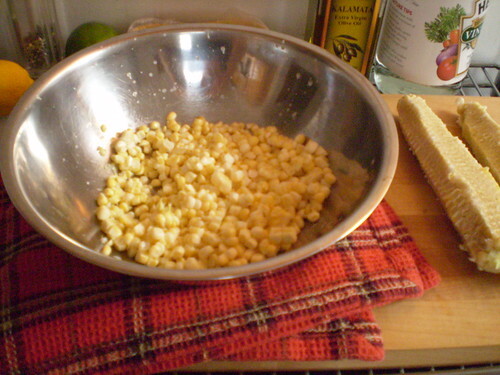 Combine that with the essential components of elote, fresh lime juice, creamy queso fresco, and some heat (either cayenne pepper or chilis) and you have elote in a bowl. I added a few ingredients to plump up the salad, which just made it a bit more into a meal. Once done, take your salad and a cold cerveza onto your fire escape and you can almost pretend you are sitting in a plaza in Mexico as the sun sets. Buen provecho! I mixed the leftovers with some cooked shrimp for lunch today. Options are endless. you're using and mix together. Easy Peasy.